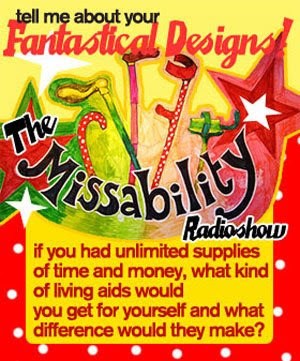 Miss Felicity Ford of Missability Radio Show, telephoned me from her hospital bed to remind us that the deadline for the Knitted WalkingStick Competition Round 2 is on 1st May 2008. Her website, www.missability.com/knittingcompetition is unique in it's attitudes to disability. Felix states that if she is going to live with pain then she will do it in style. A grey walking stick, inspires the question " Oh dear, what went wrong?" where as a knitting walking stick inspires "Wow, where did you get that walking stick?" I recommend this competition, because firstly, we all know of someone who uses stick, and we could make their days a lot happier, but secondly, you might get to know the work of Felicity Ford. There are two competition categories, 'Fancy dress' and 'The Working World.' Entries for the competition will be judged by The Oxford Bluestockings, and for each category there is a prize of £40 in yarn vouchers. Felicity is bravely steering her way through extreme pain, recovering from an operation on her toes, which means she will be able to keep running and dancing for many more years to come. Visiting her in hospital is inspiring. A blaze of colour and creativity in the corner of an otherwise rather bland ward, Felix is busy, making, thinking, writing and talking about love and freedom, and how well she is healing under a beautiful blanket, made for her by her knitting circle.